The roof is one of the most critical components of a commercial building. Unfortunately, it’s also one of the most neglected and forgotten as many property owners often overlook minor cracks and leaks only to discover more extensive damage in the long run. A professional contractor can provide you a great variety of services. These experts will do so much more than just discover and repair leaks. They also offer a wide range of maintenance services, from constructing roof flashing, repairing water damage, and replacing shingles. They can also repair a lot of other critical parts of your roof system, from vent pipes and chimneys to skylights and drainage systems. They can also repair interior damage caused by leaky roofs to make sure that your property is in good shape both inside and out. 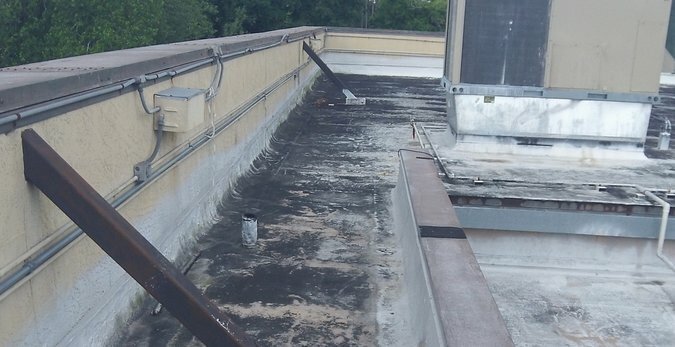 Commercial roofing contractors have an extensive selection materials that ensure reliable repair outcomes. This means any damage repair they do is guaranteed. They use specially designed roofing materials and finishes like elastomeric coating, which enhance the durability and lifespan of roofs. Commercial leak repair services are also cost-effective. Even if you have commercial-scale repair needs, these services aren’t as costly as they might seem. A professional commercial roofer will not only offer you short-term solutions to your leak problems but give you options that will help you prevent damage long term. Hiring unprofessional repair work will cost you more in the long run, especially when the temporary repairs fail and cause more irreversible and expensive damage. 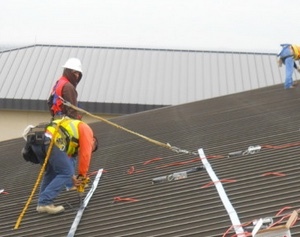 Safety is another major factor in hiring experienced commercial roofing contractors. Repairing building leaks can sometimes be quite dangerous. Professionals have all the right equipment, tools, and skills to make sure that the project goes smoothly, with the safety of their crew and the property owners in mind. They also guarantee protection of your property throughout the repair project. Here is something most commercial roofing customers don’t know – Its not easy to find negative information about prospective commercial roofing contractors. Roofing is a difficult trade. The most important factor in hiring the right commercial roofer is usually their experience in the field with successful projects. There isn’t a trade school or a real support system like electrical contractors or plumbers. A lot of times companies are started and the craft is passed on from person to person. With today’s political climate and a shortage of experienced labor, its not easy finding professional, experienced commercial roofing contractors that are qualified for your project. The hardest tasks in installing a commercial roof is working with and around the building’s air conditioning system and where more than one section of the roof meet. Are they properly licensed, bonded and insured? Ask if they have proper insurance for your project. You would be surprised how many roofing companies don’t carry adequate, or sometimes, any insurance. Also,Make sure your listed as an additional insured on their policy. This usually doesn’t cost them anything extra on their premiums and they’ll know you’ve done your homework. This will also expose the roofing contractors that don’t have either adequate or the right type of insurance. How long have they been in business? This can directly reflect on their experience in the field and if they will be around to honor their warranty and guarantees. Remember, 80% of small businesses don’t make it past their 4th year. How long have they been in business in the Austin area? Texas has a unique climate and can require different installation and repair techniques than other areas. If the commercial roofer is from another area, you must make sure they install or repair your roof to the standards of Texas, not the state they are based in. After a big storm, or series of storms, you’ll see a lot of out-of-state contractors come in to take advantage of the work and projects that develop. They could use products or materials that aren’t adequate or supported here in Texas. If an issue occurs after they complete their work, like something blowing off the roof in a future storm, and the materials aren’t readily available in the Austin area, you could have a real problem getting it repaired, much less enforcing any warranties that they promised. Storm chasers move in quickly, then disappear when the work is gone. After they leave, your support system is gone and you’ll have to find another roofing contractor to repair or even look at it. This process could take months. All of this is not worth the potential risk and hassle. Do They Warranty Their Workmanship? Manufacturers warranties are great, but most problems you’re going to have with your roofing system are going to be workmanship related and probably occur in the first couple of years. Manufacturer warranties take care of issues with the materials and products used in the project. Whereas, workmanship warranties cover any issues that happen as a result of poor installation and the craftsmanship of the labor. Keep in mind that if the warranty or guarantee seems to good to be true, it probably is. Make sure to read the fine print in the warranties for any transfer fees and exclusions. What Kind of Experience Do They Have With Your Type of Roofing System? Be sure they didn’t just start installing your product. If you have a shingle roofing system it may not be an issue, but for any other roof type- flat, metal, tile, modified bitumen, single ply, EDO/TPM – due your due diligence to ensure they have experience to get the job done right. Ask for References. Realize, however, that the references they give you are all going to be happy customers., so you’ll need to do some digging. Ask colleagues and property managers to see if you can find someone that has some personal experience with the company you’re considering. You might find some online reviews, but they aren’t as prevalent for commercial roofers as they are for residential. Keep in mind that no company will be perfect. A reputable, professional company will reach out to their customers and try to resolve any disputes or misunderstandings, so try to find a company that stands by their products and their workmanship by coming back to resolve any issues that come up after their projects are complete. If that’s the case, the negative review would most likely change their review to a positive one. Do They Keep Their Technicians Trained? If you’re going to install a certain type of roofing system on your property, call an area representative for the particular materials used and check on the companies you’re considering to see if they know if they are educating and training their technicians and crew regarding the latest techniques for installing them. This way you’ll be sure your working with a contractor that you can feel comfortable is using the correct techniques and materials to repair or install your commercial roofing system.